Is there a module 0.3, fraction 10? 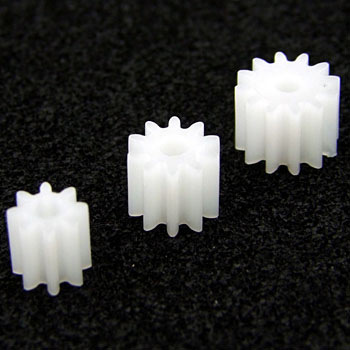 I ordered for material confirmation but ... Pinion gear for synchronous motor of old quartz watch (no step); I am looking for modules 0.3 and 10T. This review is about item#7503974. I always use it as a problem. Three point set is fine, but for each module I want you to sell it. Delivery was also quick, with goods perfect for the damaged gear. Thank you very much. The main body which was repaired was released 10 years ago and deterioration of pinion gear was inevitable and I was in trouble, but I could repair in the shadow and be able to move normally. I used it for repairing toys. It was satisfactory as it was able to be mounted without processing as it was. Toys which have repaired with this will still do their best. I would like to take care of it. Not all the gears were necessary, only one of these was necessary. Since I did not have rose sales, I bought three sets of items, but the price was also cheap so there was no problem. Quality was not bad, it was satisfactory. Because the axle gear of the pla rail has broken, I repaired using this product. Indeed it was neither possible nor impossible, it was a toothed gear. Although it was just a gear, I had no particular impression, but I strongly thought that it was hard, white and cool. Of three, two, it was the size you wanted! It was saved! I think I will purchase again! I use it at a toy hospital. Recently toys are often driven by electric motors, but this gear often cracks and it runs idly. By replacing the toy, the toy rises easily. I would like to have a set with 9/11/13 teeth, if possible. This review is about item#07503974. It is easy to use by fitting to the shaft of the motor without processing it. We distributed 50 pairs this time to five hospitals. I used it as a driving gauge for my hobby bike meter. I am satisfied. I was saved because I could purchase such things. I am thankful that the price is cheap. Because the item explanation is insufficient, I bought referring to the product image, but the 8-tooth pinion gear was small with a boss and it was not possible to customize the Tamiya model gearbox. It was unnecessary including the order code: 07503983 · 07503956 because it was not able to use it unlike the image. I always write it over and over again and again, please write the item description exactly. Also, please do not leave the representative image and do not update the old image. Please post the image of the item itself to ship. When I started handling, eight teeth might have been green, but now it is white. Along with changing the color, was there also a change in shape? Is it? Although I was planning to make a transmission model using the three types of gear set purchased this time and the gearbox of the Tamiya model, it is spoiled. Even if it can not be returned, these three points will receive returned goods. If impossible, Monotaro please get it.